On the edge of the golf course, a modern house in provençal design, set in a large, leafy, south-facing garden. Magnificent views of the Sainte-Baume massif. Comfortable rooms, tastefully decorated with antique furniture. Breakfast is served on the terrace in summer. Warm welcome..
2 rooms with shower, WC and TV. 95 euros (1 pers. ), 105 euros (2 pers.). 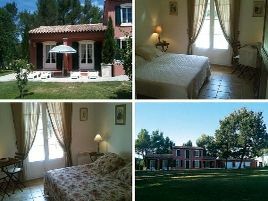 Two gîtes also for weekly rental. Rates on request.